A slowdown is coming, but not one so deep as to be called a recession. Lately, that seems to be the prognosis of economic forecasters everywhere, and it has led to a real change in the policy stance of the world's largest central bank: the US Federal Reserve. The latest meeting of its Federal Open Market Committee confirmed that the central bank does not intend to raise interest rates this year. Even as the committee lowered its economic expectations, it put on a mildly optimistic spin: With luck, maybe growth will be robust enough to raise rates in 2020. After an era of historic quantitative easing, with so many returns in fi xed income going into negative territory, we enter a new phase. Earlier expectations that the Fed would soon be raising interest rates every three months have disappeared. If US rates will not rise as was expected, then earlier forecasts for other economies must now be re-thought. In particular, what does the shift mean for emerging markets? Will moderated potential for US returns stimulate the appetite for investment elsewhere? There is no obvious answer, but the change is forcing other central banks, in developed and emerging markets, to come to terms with this new reality. Globalization means that what happens in the world’s largest economies a ects everybody. The Fed’s moderately upbeat tone could not hide looming uncertainties: trade tensions between the US and China, the Brexit saga and more. Surely the capacity for global institutions to navigate these issues will depend in no small part on whether trust can be established among the parties. In this issue, we tackle the issue of trust at a corporate level, and its increasing relevance in the era of social media. Recent studies have begun to home in on the bottom-line impact of trust—witness recent damage to Boeing and even the US Federal Aviation Administration—and to outline the type of consistent long-term investment in culture-building required to nurture public trust. Crisis management is not enough any more. 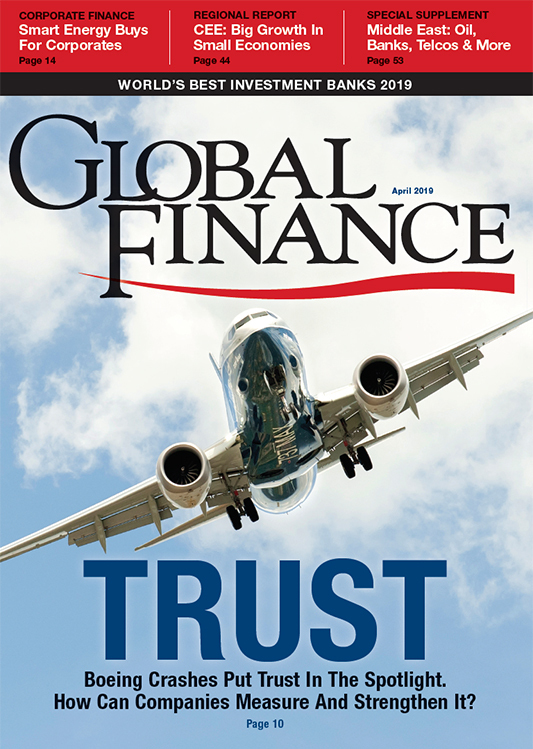 These issues are of particular importance to the financial industry, as its reputation sustained heavy damage from the global financial crisis and subsequent scandals; financial institutions currently remain among the world’s least-trusted companies.